I know that we've got some folks here that are pretty serious about hunting. 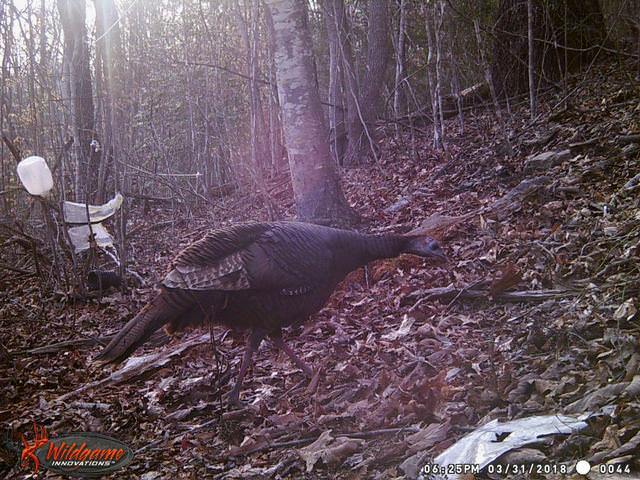 Just curious if anyone else is planning on doing some spring Turkey hunting? I will be hitting the woods on the weekends. Just had our local NWTF Chapter Banquet last week and the spring seminar/workshop is coming up April 7th. Last time I went up to the cabin, there were a lot of scratches in the leaves, but none that looked very fresh. I may be wasting my time trying this year but that's why they call it hunting. I know they're there, but they move around a lot. They'll come down to the cabin every day like clockwork for a week, then you'll hear them in the next holler over for a couple of days. None in my area. 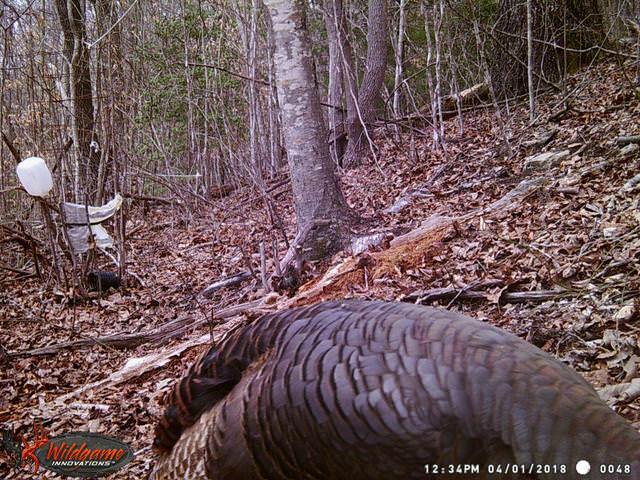 I miss the sound of a gobbler in the hardwoods of PA many years ago. Yeah, I love living in the Appalachian mountains. I would be very hard to adjust trying to live anywhere else. 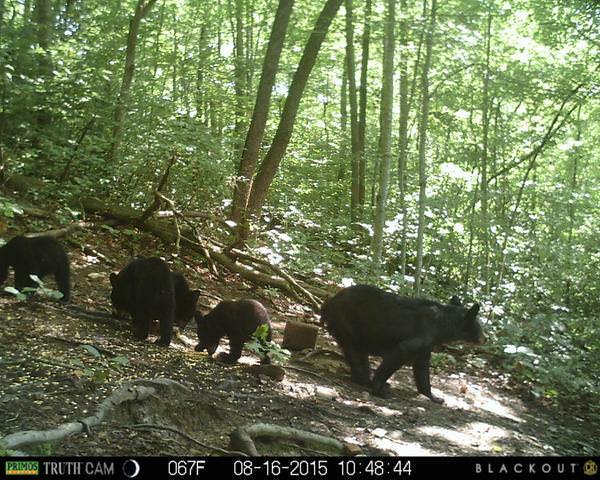 Well, not to run off-topic, but black bears here are common as rabbits or deer used to be in PA. I could post up the pic of the calling card left on my front walk the other year, and the 5 bears we had (at one time) up and down the neighborhood. The game is just different. 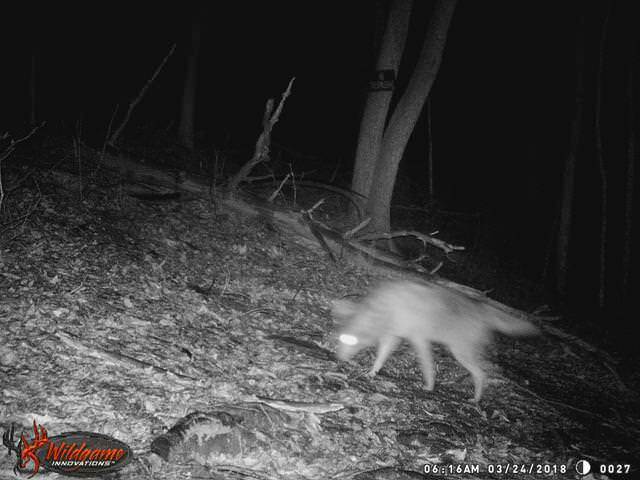 But I miss big squirrels, rabbits, turkey and such (no true small game seasons here unless you trap). It's just different. How long has it been since you've been back to PA? I live on the KY/TN/VA border and we're covered up with them. I hate bears as much as I do coyotes. Neither are worth a dime to me dead or alive. Had my cameras out a couple of weeks now, and have gotten pics of the regular crowd, plus several deer that are new (4 new young ones). It wasn't really a mild winter, but surely wasn't as bad as several in recent memory. So, was a good year for the deers. 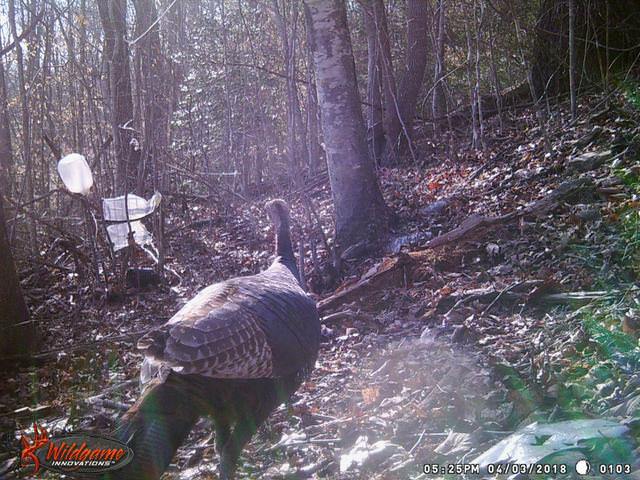 I have a few different gobblers coming in, but if there are less than 4 or 6, I will likely skip this spring season so I won't put any more pressure on them than the damn coyotes. 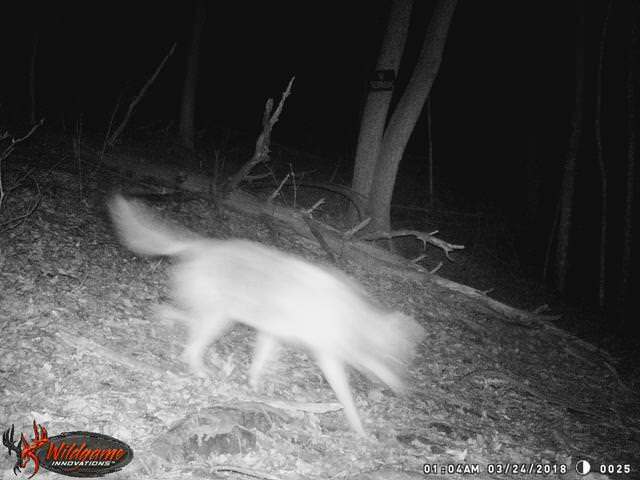 I think instead of turkey hunting this spring, I'm going to set up a caller and see how many yotes I can knock down instead. John A. wrote: How long has it been since you've been back to PA? We got back as tourists just a few years ago, but not on any regular basis. Might go back this fall for a HS reunion. Got my MI Thunderchicken a short while back (Sorry I thought I had posted it already!! I got out well before light and got set up in the deer/turkey blind I have been using for the last few years. I had not had much time to scout this season so I figured I would hunt here this morning and adjust accordingly. It was a pretty loud morning with lots of geese and cranes chattering all around the field, silenced only by the intermittent rainfall. I got out a bit before shooting hours so I had a chance to just sit and take in the sounds of the morning before I got into hunt mode. Once it got light I could hear an occasional gobble in the distance but nothing responded to my calls. I had two decoys set up. 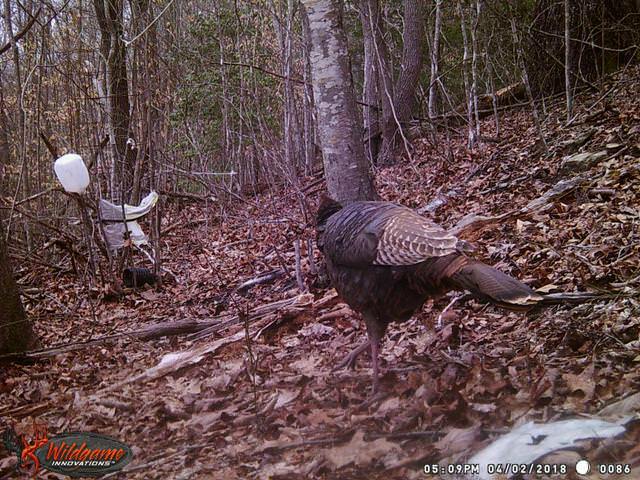 One was a hen and the other was a strutting tom with a real fan as the tail. I normally don't like to use this first off but I figured what the heck. About 90 minutes had passed from the start of shooting hours and I was watching some geese in the field when some motion caught my eye and I looked up to see a tom checking out my decoys. By the time I saw him he was looking a little nervous but I was able to get a shot off before he decided he didn't like my decoys. He came in totally silent so I do not know if he came into the call or the decoys, either way the plan came together. and after about 90 minutes of hunting I tagged out in MI. He was only about 10 yards away, if that, when I shot him. I had run out and gram him as he did a fair amount of flapping around. I was covered in mud by the time he was done.